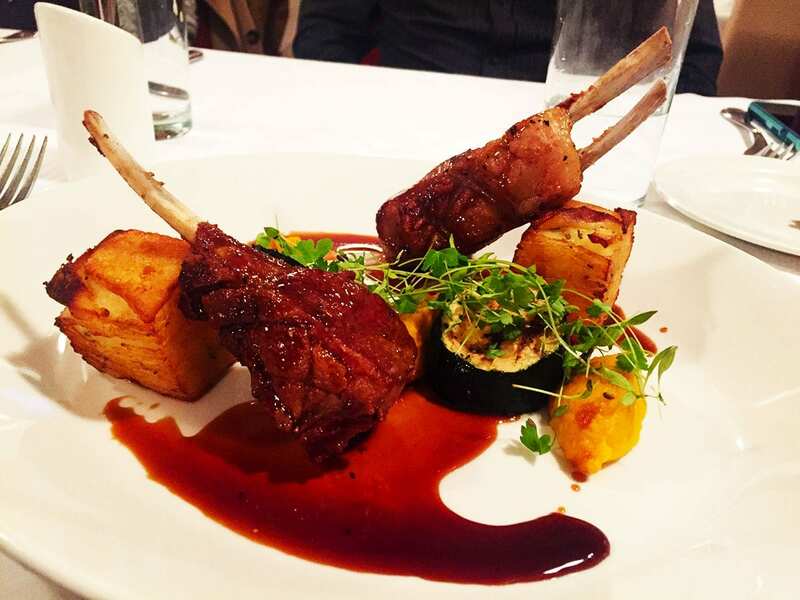 This year our hungry travel adventures took us to Dublin, Ireland’s capital and hidden gem of a foodie paradise. This city is truly a hidden secret of amazing food in Europe. We had such a great time exploring the city and meeting so many amazing people that it left a special place in our hearts. The city was full of nomnom cuisine from all over the world. We just fell in love with all of it left as very satisfied foodies. Interesting food fact from the trip is that most restaurants we encountered were not Irish. According to some locals we spoke, Irish places are mostly for tourist and Dublin is more known for French and Italian food. 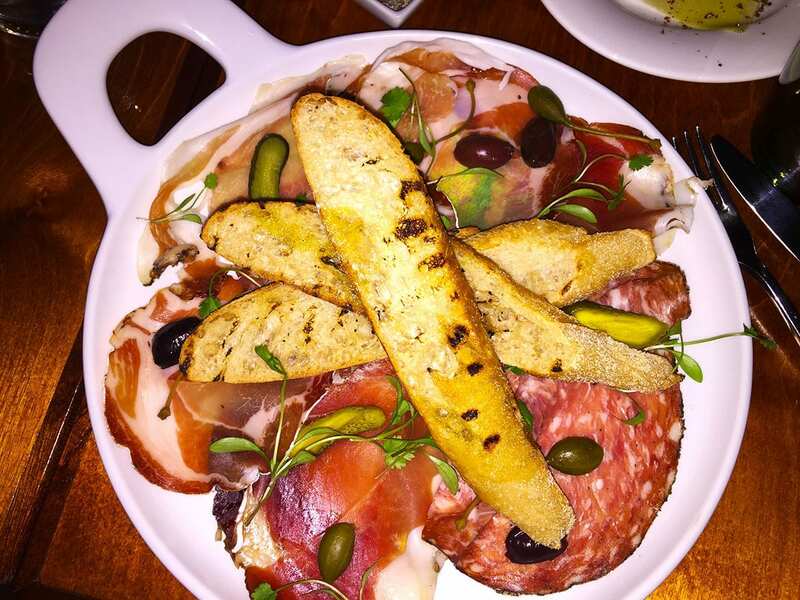 Here are some of our favorite dishes that we think you just have to try on your next trip. We are sure to come back to few of these places. Enjoy a perfect Italian dish from a rooftop bar restaurant Sophie’s with a view of the beautiful Dublin, especially on a nice day. This was probably one of our most favorite dishes from the trip. 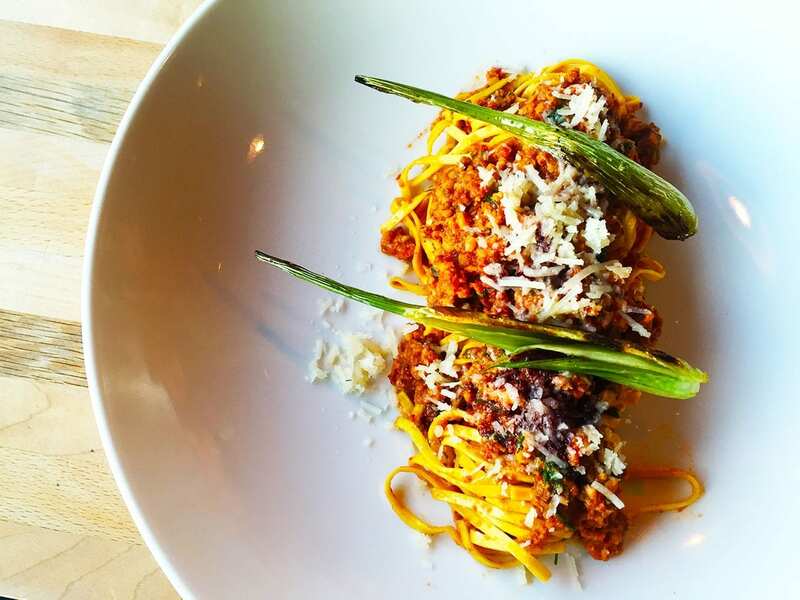 Both beautiful and one of the best tasting pasta dishes we’ve ever had. The perfect combination of calamari and spiced chorizo with aged parmesan. The hand rolled pasta was very light and soft. Every bite was pure joy and it’s one of those dishes we had to enjoy slowly to savor every bite. Not the cheapest dish for €25 ($27), but totally worth it when you enjoy one of the best Italian dishes ever. Make sure to stop by Sophie’s for good food, drinks, and the view. Ahoy, the fun begins at the boat pub that serves up some fun drinks and fancy food right on the River Liffet in the middle of Dublin. How often can you enjoy a nice dinner on a boat? Not something we do very often so we decided to go all out. There was lots of drink and lots of eating. When they brought out this dish we were totally amazed at how beautiful it looks. The meat was cooked to perfection, glistening on the outside and juicy on the inside. Plus a little bit of fat made it even better. It was just falling off the bone. Served with a side of amazing potatoes, eggplant and sauce. Definitely liked how potatoes were cut into rectangles and cut into small slices stacked on top of each other. This is a super cheap dish for the quality for just €9 ($10). You are more likely to get more for your buck here. Sadly the boat doesn’t move and always stays in one location, but that doesn’t decrease the fun experience of being on the water. Oh my, I like my meat big and tasty when it comes to appetizers like this Wild Boar Porchetta from Drury Buildings, modern Irish restaurants in Dublin. We were super hungry after exploring the city all day and wanted something quick and tasty. This was truly pure perfection, the wild boar literary exploded with flavor in our mouth. Very thin and light, yet the flavor just overpowered all senses. Big fans of Olives and pickles that added that very strange and strong flavor. This is the dish that we don’t share with friends because it all mine and no one can have it! Not the cheapest dish for €13 ($14), but it was zero regrets kind of a dish. Everything about this dish was pure joy and made it one of our favorites from the trip. 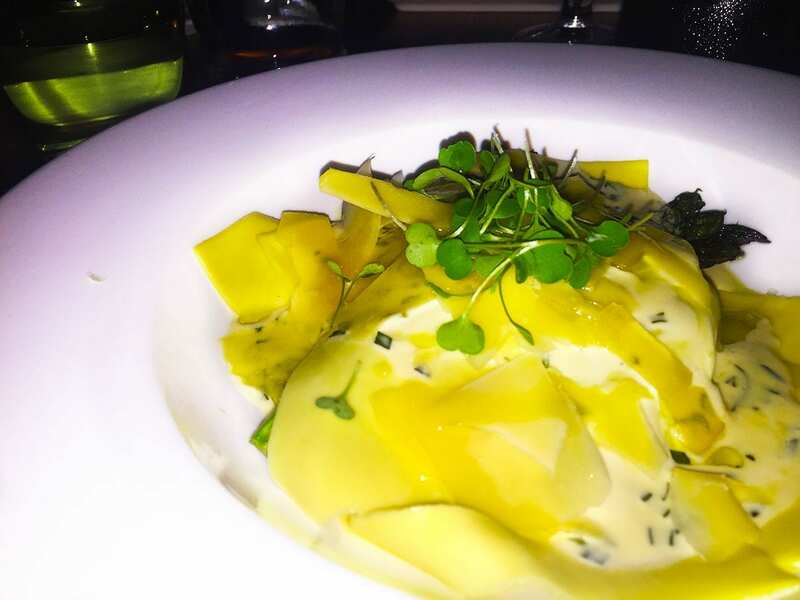 It’s all about the pasta fun times when trying Truffle Pappardelle dessert at Drury Buildings, a modern Irish restaurant. Who would have thought that the capital of Ireland is also home to some of the best Italian pasta dishes in the area. Just fell in love with hair-thin wide pasta with truffle pecorino cheese and white sauce. The thinnest of each noodle make some wonder how they do it? Not the cheapest dish with lunch for 14 ($15( and dinner for 23 ($24). Still, this dish is worth every euro! 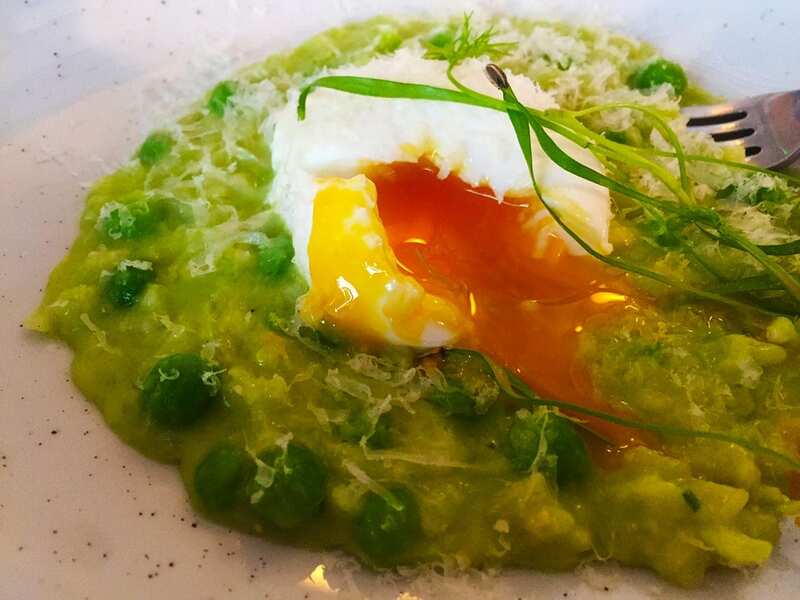 You are about to have risotto like any you’ve ever tried before Pea & Leek Risotto, amazing appetizer ever from Pitchet, a French restaurant in the heart of Dublin city. This was a pure accident kind of a place, we had to stop here because we got totally soaked in yet another rain and needed a place to dry off, get a few drinks and some snacks. We are big fans of poached eggs and we just had to try it when we saw an appetizer with one. This was flavor mesmerizing with a combination of perfectly poached egg and soft risotto. The texture alone made this excellent dish. We enjoyed this as part of their 3-course meal for €25 ($26) which was totally worth an amazing deal. 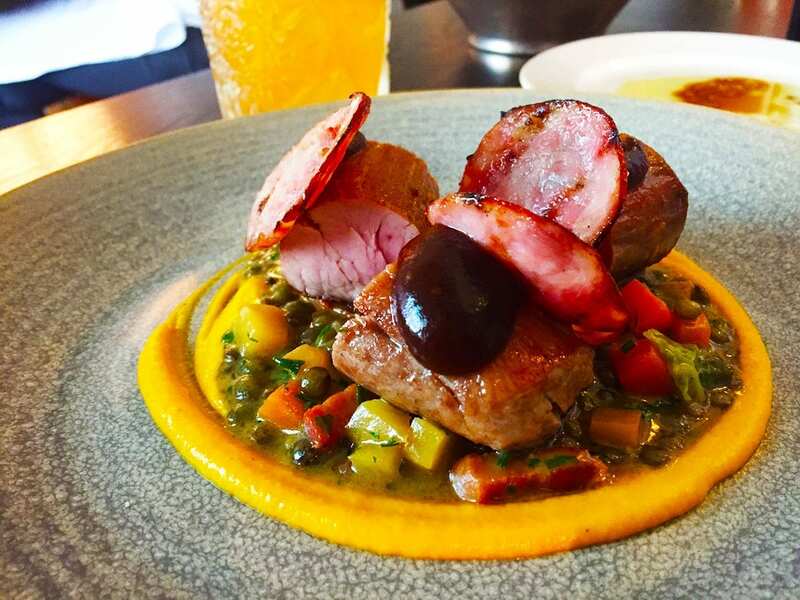 Upscale your pork with an order of Pork Fillet from Pitchet, one of our favorite French restaurants in Dublin. Just look at this dish, presentation alone would make you fall in love with it. Pork fillets were prepared and seasoned perfectly. Plus the brown sauce added a nice and pinch of strong flavor to excite your taste buds even more. Went great with roasted vegetables, lentils and bacon cream. This is the kind of dish you enjoy slowly and a little bit of everything in every bite to savor it all. Similar to appetizer this dish was a bit small but yet delivered big on flavor and enjoyment. Not every dish must be giant and food coma-inducing. Leaves more space for dessert. We enjoyed this as part of their 3-course meal for €25 ($26) which was totally a worth an amazing deal. 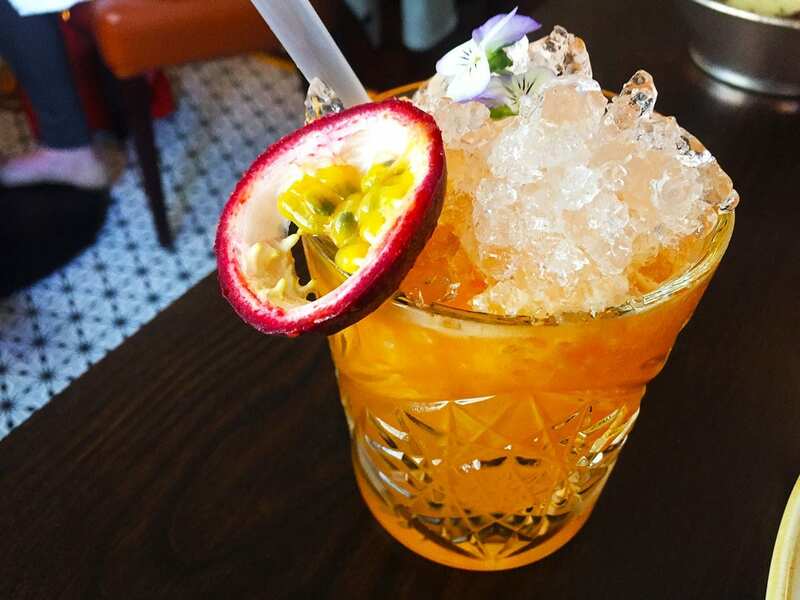 Get passionate about drinking with Passion Fruit Mix Drinks from our new favorite French restaurant in DC Pichet. We are in Ireland, after all, there should be lots more drinking than usual. We asked the waiter for something very sweet and so he recommended this beauty. Not sure I can even drink this piece of art. We finally broke down and tried a bit and then some more until we realized we are drinking the whole thing. very fruity and very sweet drink which is perfect for those of us with a sweet tooth. Sometimes it’s not just the hype when you’re trying Pulled Pork Special at Brother Hubbard a popular Middle Eastern restaurant in Dublin. This place came highly recommended to us by several people and food site so we were very excited when we finally made it. We just have to try anything that comes with an egg on top. Plus came highly recommended by the waitress when we told her how hungry we were. 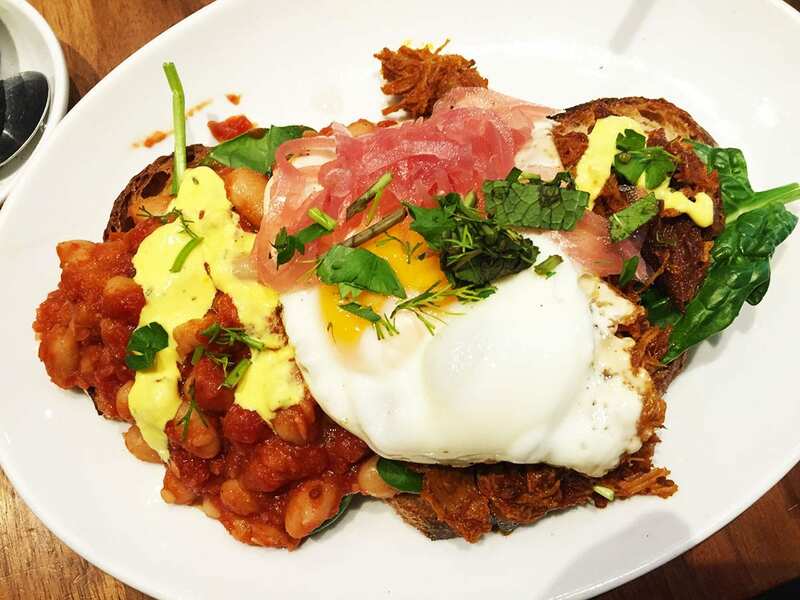 This will defiantly satisfy any hungry nomster because it’s an overnight roasted pulled pork sandwich covered with beans, eggs, and pickled onions. Plus comes with turmeric-lemon yogurt and hazelnut dukkah. There is a lot going on in this pile of nomnom awesomeness and we are loving it all. It’s the kind of sandwich you have to eat with a knife and a fork. Pretty much a pile of nomnom awesomeness. Lots of food for low price €10 ($11). 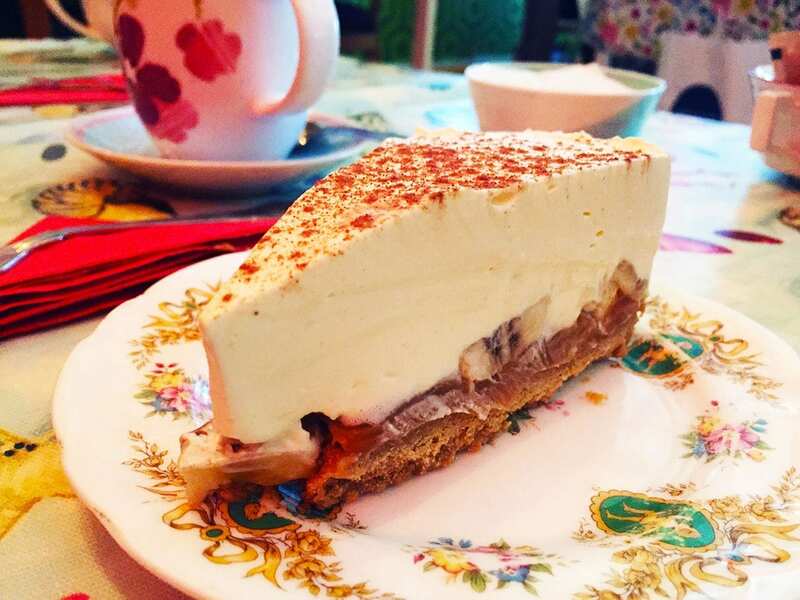 More pie means more happiness in the world, especially when enjoying nice Banoffee Pie from popular and quirky dessert place Foam Cafe in the heart of Dublin city. Very artsy and unique place that everyone must visit for a nice cup of coffee and of course tasty sweets. So many choices that it was a bit hard to pick. Got to admit, we never had a banana pie before and it was a very nomnom experience. Just fell in love with the thick and yet soft layer of banana whipped cream on top and crumbled biscuits with toffee crust on the bottom. It wasn’t overly very sweet so you can totally enjoy another slice. Great price too for just €5 ($6) for one slice. This place came highly recommended to us by the awesome @GastroGays, so make sure to follow them for more great foodstuff. 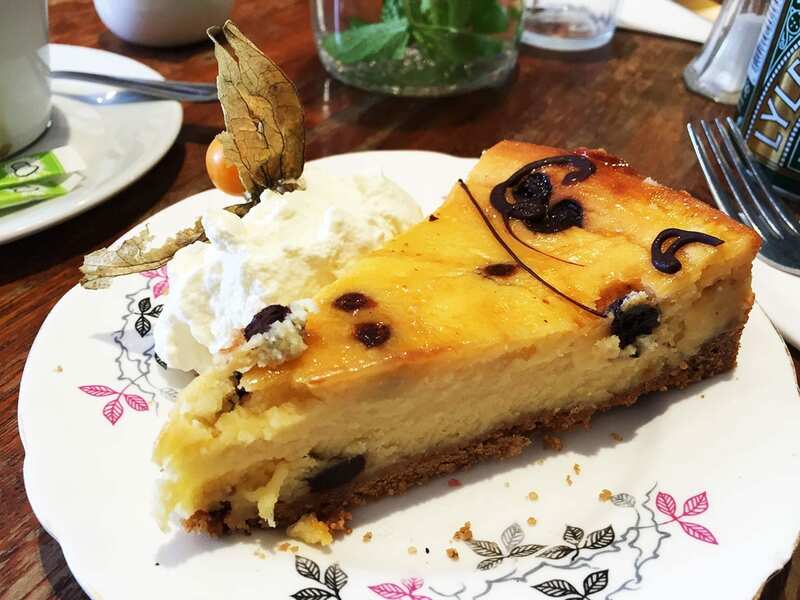 Eat like a queen with cheesecake for breakfast with Bailey’s Chocolate Chip Cheesecake from Queen of Tarts, a famous breakfast & brunch dessert cafe in Dublin. Is it not an Irish experience unless everything has alcohol in it? Now that’s a cheesecake, very dense chocolatey cheesecake. It alone might just fill you up, but fear not, they have other great dishes there. Great price for such a good cake for just €4 ($5). Another place that came highly recommended to us and was totally worth it for both desserts and full brunch.